Philadelphia Eagles center Jason Kelce prepares to lay down a block for tight end Dallas Goedert. Not only did Kelce play in all 16 games, not only was Kelce voted first team All-Pro by four different publications, and not only was named the top center — and the third best offensive lineman overall — in the NFL by Pro Football Focus, but Kelce did all of this while playing through several serious injuries. On Monday, Kelce met with the assembled media at the NovaCare Complex as the Birds offseason workouts got underway for the first this year, and when talking about his decision to return to the Eagles for at least one more season, the 31-year-old center revealed that he was playing with quite a bit of pain in 2018. "Last year I played through a Grade 2 MCL sprain, a broken foot, other nagging things that have been building on me. I had a torn elbow," he said. "At one point, I had a brace on the entire left side of my body, and that starts to bother you a little bit." Kelce went on to say that everything has since healed — or, "As healed as it's going to get" — and that he's looking forward to another season in midnight green. That wasn't always guaranteed this offseason, as Kelce again strongly considered retirement before signing an extension with the Birds. 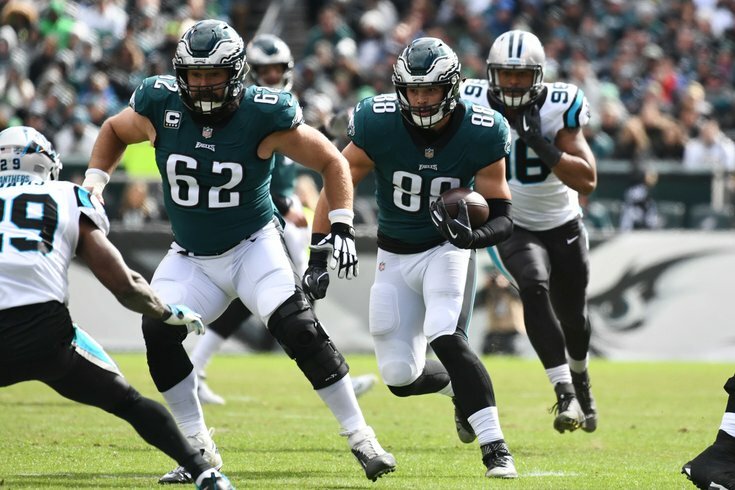 But with Kelce back in the fold, the Eagles will maintain continuity along the offensive front for another year, looking to improve on their line that ranked fifth in the NFL last season according to PFF. After Kelce allowed his body to recover from that previously mentioned string of injuries, he ultimately came to the decision that there were more reasons for him to return than to head off into retirement. "Obviously, all the reasons to keep playing are still there," Kelce, 31, said. "You love playing the game, you love being around the guys, competing, battling together with people you care about — all that stuff is still very strong in your mind. As you get older, other little things peak up. I just think at this point there's still too many positives, not enough negatives to really seriously step away from the game." Kelce, who is now under contract with the Eagles through 2021, said he'd revisit his future following this season — just as he has done each of the last few years. But, for now, Kelce is an Eagle. And that's good news for the entirety of the Birds offense. Will he last through the life of his contract? Probably not if he continues to be forced to play through the amount of injuries he faced last season. However, a piece of advice Kelce got from a friend — a quote most often attributed to Ben Franklin — suggests that as long as Kelce is unsure of retirement, he should keep playing. "It was very, very clear that I wanted to keep playing ... so I don't know what it's going to be like when I ultimately make the decision not to keep playing, but I got a pretty good word of advice from a good friend of mine that said, 'When in doubt, don't.' So, I'm going to stick to that."